Are you an all-round sports fan? Do you enjoy a range of sports and follow all the action on everything from football to darts? Do you consider yourself to be knowledgeable about many different sports? 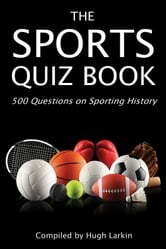 If so, the time has come to find out how much you really know with The Sports Quiz Book. Which club was the first British football team to win a European club competition? The Thomas and Uber Cups are the world team competitions in which sport? What year did Virginia Wade win her only Wimbledon singles title? The answers to all these questions and more can be found in this fascinating new quiz book. With 500 questions on all aspects of sporting history this book covers football, rugby, golf, cricket, boxing, horse racing, athletics, baseball, basketball, American football, winter, water and minority sports and much more. Packed with information, including many little known facts, this book is certain to appeal to anyone who has a love of sport. So why not treat the sports fan in your life?